The H Factor: October is BOOgle Time with Tricks AND Treats! October is BOOgle Time with Tricks AND Treats! Last year, our district did it- we "went Google!" Our staff trained our teachers, and let them loose to explore the massive world that is Google Apps for Education. Buwahahha?! Nah, don't be scared- it's just BOOgle. (Click on image to enlarge, click enlarged image to begin slide show. We have been excited to see how our teachers are using the Apps, and happy to tutor them along the way. 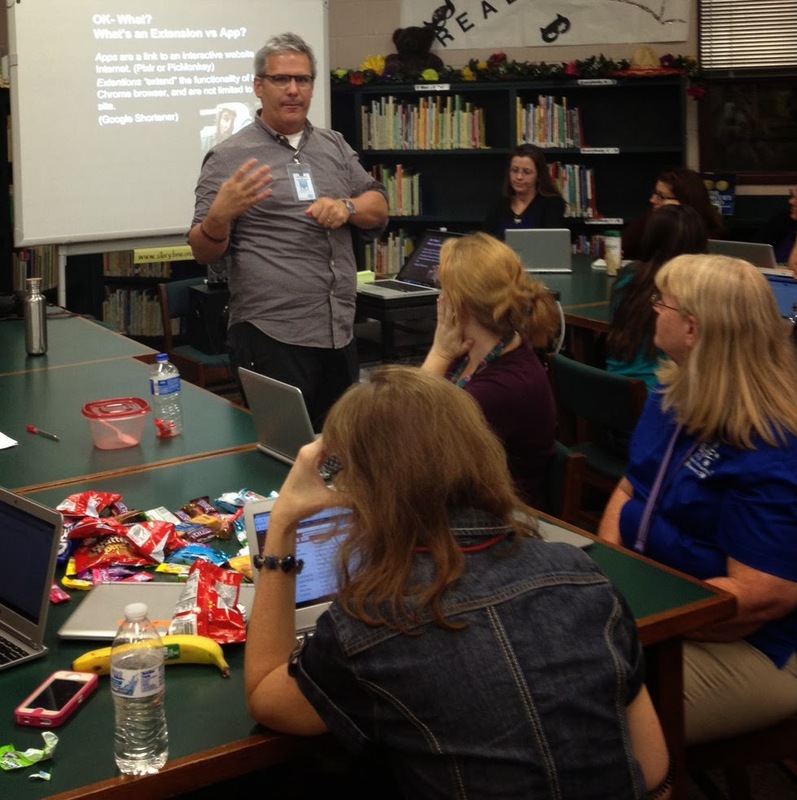 As it's been a year, we think it's a great opportunity to reconnect, so our district tech training initiative for the month of October is what we call BOOgle. BOOgle is a series of sessions that review the features and provide a reorientation of not only how the Apps work, but how they work together. Samuel W. Houston Elementary's Counselor just received a shiny new Chromebook! The Google Apps Suite is huge, so there's a lot of territory to cover. This month's effort focuses on reorienting teachers with the 'global view' of the Google Apps for Education suite, and a demonstration of how powerful the Apps are in transforming their work life. And it's a chance to give out candy...and chips! 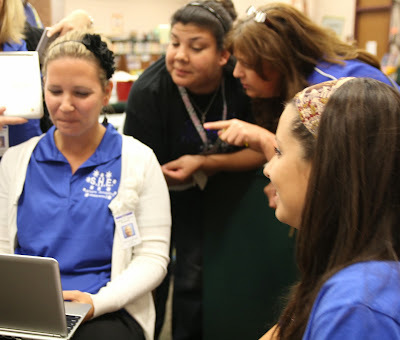 Samuel W. Houston Elementary teachers get down to business. Betsy Marlin and Kayla Provencio look on. After the BOOgle training, we will be available to follow up in small groups with teachers' App-specific questions.